of squared pear shape, with wide bulging sides below concave rounded shoulders applied with a pair of taotie masks cast in low relief, inlaid in gold and silver with stylized dragon heads and interlaced serpentine scroll motifs on all four sides, the flared mouth with a raised border inlaid with diamond-shaped and leiwen-style decoration, raised on a high foot inlaid with an interwoven undulating line border, the polished surface with an attractive dark chocolate brown patina. 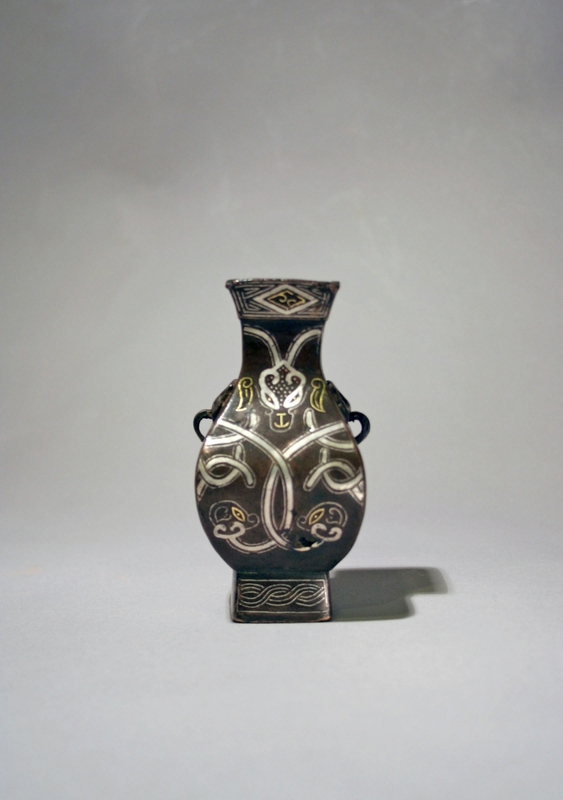 A slightly smaller bronze vase of the same form and inlaid in gold and silver with the same pattern of decoration, from the imperial palace collection, is illustrated in the catalogue of the special exhibition Through the Prism of the Past: Antiquarian Trends in Chinese Art of the 16th to 18th Century, National Palace Museum, Taipei, 2004, p. 65, pl. I-41. 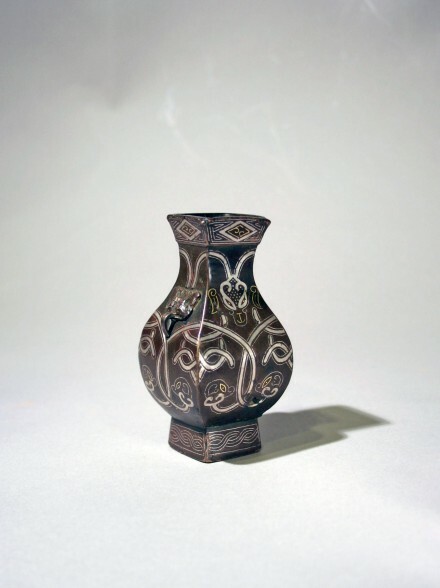 Compare also the small bronze fanghu with archaic style decoration inlaid in silver wire, marked on the base with a signature of the Shisou in clerical script, illustrated by Mowry, China’s Renaissance in Bronze: The Robert H. Clague Collection of Later Chinese Bronzes, 1100-1900, Phoenix Art Museum, Arizona, 1993, pp. 94-97, no. 17.